(Bear with me a bit, I promise I do get to the title eventually) One of the most formative classes I took in college was a class taught by Professor Doug Melton on stem cells. While truth be told, I’ve forgotten most of what I used to know about the growth factors and specifics of how stem cells work, the class left me with two powerful ideas. The first is that true understanding requires you to overcome your own intellectual laziness. Its not enough to just take what a so-called expert says at face value — you should question her assumptions, her evidence, her interpretation, her controls (or lack thereof), and only after questioning these things can you properly make up your own mind. While I can’t say I’ve lived up to that challenge to the fullest extent, its been a helpful guide in my coursework and in my career as a consultant, then investor, and now entrepreneur. The second was about the importance of personal passion as a motivating force. Professor Melton’s research and expertise into stem cells was driven in no small part by the desire to find a cure for diabetes, a condition which one of his kids suffers from. It was something which made him (and his lab) work harder at finding a way to take on the daunting task of taking stem cells and turning them into the beta islet cells in the pancreas that produce insulin. It made him advocate for the creation of the Harvard Stem Cell Institute and to strongly vocalize his opinions on legitimizing stem cell research (something which I had the pleasure of interviewing him on when I worked with Nextgen). Having met various members of the Melton lab (as well as the man himself), I can’t say how happy I am for the team and how great it is that we’ve made such a breakthrough in the fight against diabetes. Sony’s announcement of the PlayStation 4 today has gotten a wide array of responses from the internet (including, amusingly, dismay at the fact that Sony never actually showed the console itself). What was interesting to me was less the console itself but what is revealed about the tech industry in the pretty big changes Sony made over the PlayStation’s previous incarnations. 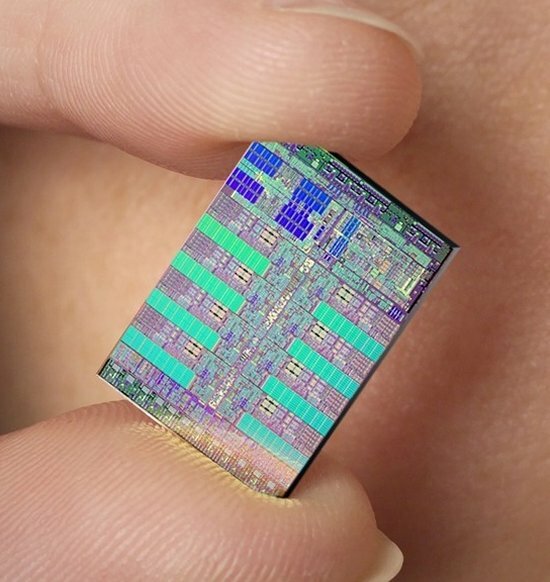 They give a sign of things to come as we await the “XBox 720” (or whatever they call it), Valve’s “Steambox” console, and (what I ultimately think will prevail) the next generation of mobile platform-based consoles like Green Throttle. Regardless of if the PS4 succeeds, these are interesting changes from Sony’s usual extremely locked-down, heavily customized MO and while there are still plenty of details to be described, I think it shows just how much the rise of horizontal platforms, the boom in mobile, the maturation of the cloud as a content delivery platform, and the importance of social engagement have pervaded every element of the tech industry. I might have been crazy late with April, but for May, my on-timeliness when it comes to the paper a month posts is returning with a vengeance. This month’s paper from Cell (a journal I usually avoid because their papers are ridiculously long :-)) dives beneath the surface of one of the classic examples of genetics used in almost every intro-to-genetics seminar/class/textbook. As you probably know, living things typically receive two sets of genes: one from the mother and one from the father. If those two sets of genes result in the same protein, then the organism is said to be homozygous for that particular trait. Otherwise, the proper term is heterozygous. In classical genetics (i.e. what was painstakingly discovered by Gregor Mendel, the “father of genetics”), being heterozygous, to a casual observer, was usually something that could only be seen after multiple generations (or with a DNA test). This is because even though the individual has two different versions of the same gene, one of them is “dominant”, expressing itself more loudly than the other. 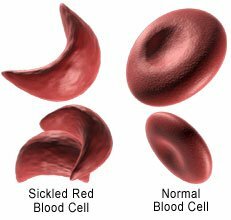 For the mutation which causes the disease sickle cell anemia (see image to the right as to why the disease is called “sickle cell”), however, the truth was a little different. While heterozygous individuals did not suffer from the problems associated with sickle cell anemia, unlike individuals homozygous for the “normal” gene, they showed a remarkable advantage when it came to surviving infection with malaria. It is one reason scientists feel that sickle cell anemia continues to be endemic in parts of the world where malaria is still a major issue. But, how the sickle cell disease mutation did this in heterozygotes was not well-understood. The authors for this month’s paper tried to probe one possible explanation for this using mice as an experimental system. The interesting thing that they found was that mice that were heterozygous for the sickle cell trait (HbSAD), despite having better survival against malaria than those which were homozygous for the “normal” gene (HbWT) (see the Kaplan-Meier survival curve in Figure 1A below, showing the proportion of surviving mice over time), did not have a significantly different amount of infected red blood cells (see Figure 1F below). So if the sickle cell gene wasn’t reducing the number of infected cells, what was causing the improvement in survival? The researchers knew that red blood cells which are heterozygous for the sickle cell trait will often “leak” an iron-containing chemical called heme into the blood stream. Because heme just floating around is toxic, the body responds to this with an enzyme called heme oxygenase-1 (HO-1) which turns toxic heme into the less toxic biliverdin and carbon monoxide (CO). The researchers considered whether or not HO-1 was responsible for the improved ability of the mice to avoid cerebral malaria. In a creative experiment, they were able to show that the sickle cell mice needed HO-1 to get their better survival – mice which were genetically engineered to be missing one copy of HO-1 (Hmox1+/-), even if they were heterozygous for the sickle cell disease, did not survive particularly well when infected (see Figure 2B below, left for the survival data). In fact, they were even able to show that if you took mice which did not have any sickle cell trait gene (the HbWT group), and replaced their blood system using irradiation and a bone marrow transplant from a heterozygous sickle cell mouse (HbSAD), you only improve survival if the cells come from a mouse with its HO-1 genes intact (Hmox1+/+) (see Figure 4A below, right). So, overall, what did I think? First the positive: these are extremely clearly designed and well-controlled experiments. I could only show a fraction of the figures in the paper, but rest assured, they were very methodical about creating positive and negative controls for all their figures and experiments which is fantastic. In particular, the use of bone marrow transplantation and genetically engineered mice to prove that HO-1 plays a key role in improving survival were creative and well-done. What leaves me unsettled with the paper is the conclusion. The problem is that the trigger for HO-1, what the authors have shown is the reason mice which are heterozygous for sickle cell anemia survive malaria better, is heme, which happens to also be what the authors say is the cause for many of the survival complications. It’s like claiming that the best way to cure a patient of poison (heme) is to give the patient more poison (heme) because the poison somehow triggers the antidote (HO-1). In my mind, there are two possible ways to explain the results. The first is that the authors are right and the reason for this is around the levels and timing of heme in the bloodstream. Maybe the amount of heme that the sickle cell heterozygotes have is not high enough to cause some of the malaria complications, but high enough so that HO-1 is always around. That way, if a malaria infection does happen, the HO-1 stays around and keeps the final level of heme just low enough so that problems don’t happen. The second explanation is that the authors are wrong and that the carbon monoxide that HO-1 is producing is not reducing the amount of heme directly, but indirectly by reducing the ability of the malaria parasites to kill red blood cells (the source of the extra heme). In this case, sickle cell heterozygotes have chronically higher levels of HO-1. Both are testable hypotheses – the first can be tested by playing around with different levels of heme/HO-1 and observing how the amount of free-floating heme changes over time when mice are infected with malaria. The second can be tested by observing test tubes full of red blood cells and malaria parasites under different amounts of carbon monoxide. In any event, I hope to see further studies in this area, especially ones which lead to more effective treatments for the many millions who are affected by malaria.